Grip with two hands. Silver and plastic design with 0.1% resolution. Measures body fat from 4% to 45% and body water from 37.8% to 66%. Features modes for adults and children, 8-person memory. Also includes lithium batteries. 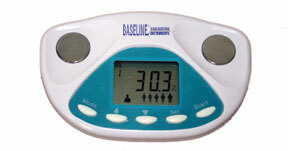 Hand-held body fat analyzer produces a body fat percentage reading without having to pinch skinfolds. 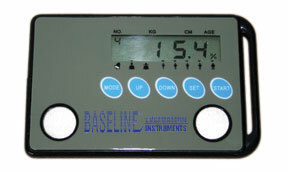 Palm size unit measures body fat % in a 5-50% range with 0.1% resolution. Dimensions: 4" x 0.25" x 2.25"
Portable low cost, credit-card style handheld instrument measures body fat % in a 5-50% range with 0.1% resolution.